Jack’s Night Market puts the focus on local food and art purveyors in the square. 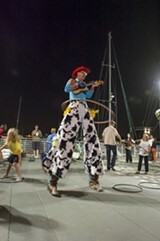 A hula-hooping stiltwalker at Jack's Night Market. 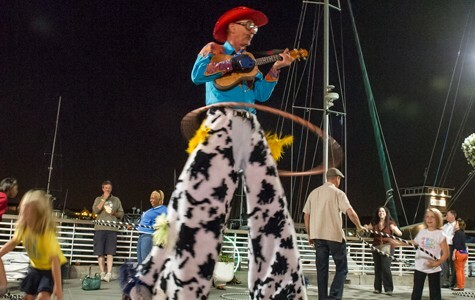 The first Friday of the month in Oakland is not lacking in events to attend, but the upcoming night market in Jack London Square — the last one happening this year — is definitely one to add to your list. The outdoor bazaar was founded last summer with the goal of supporting First Fridays while also offering Oakland residents something to do on the waterfront. "It's just a big festival that celebrates the talent that's so profuse in the city," said Mark McLeod, the former executive director and current board member of the Sustainable Business Alliance, a partner and beneficiary of the night market. According to McLeod, Jack London Square was a central gathering place back in the 1950s. He lamented that the neighborhood had declined for a while, losing investment and funding. But he has been heartened by the renaissance he has witnessed in the past five or six years, with many new restaurants and shops popping up. The night market is intended to highlight those businesses. Event organizers describe the program as homegrown and emphasize the importance of putting local artisans and food vendors on display. The beer and wine that's served comes from Oakland brewers and winemakers, often those who are making their products in converted industrial spaces just a few blocks away from the square. "The beer is brought over by bicycle," said McLeod. The event, which McLeod described as a "multi-generational family version of Mardi Gras," features a pinball museum exhibit, fortunetellers, and stilt walkers. Attendees can also participate in an "outer body experience" in which they wear special goggles that allow them to see a virtual reality maze that they walk through. (They can also try to catch sight of the Mechanical Swamp Kirin, a nine-foot-tall mythical creature covered in moss that has become the night market's unofficial mascot.) Local craft merchants, such as Oaklandish, Loakal, Tracilynn Fashion, and Frankie and Myrrh, will be selling their wares. And food vendors like Peter's Kettle Corn, the Pacific Coast Farmers' Market, Nora Spanish Cuisine, and Antonik's BBQ will also be on site to offer sustenance. Beer and wine sales benefit the Sustainable Business Alliance and Oakland Grown. This week, two local dance troupes will be performing and then teaching the attendees their moves: Mirabai Deranja will demonstrate an Argentine tango and Leslie Panitchpakdi will show off her hip-hop style. Organizers say the night market draws a crowd of about 5,000 and has succeeded in increasing the visibility of the area. They plan to bring it back next summer as well. 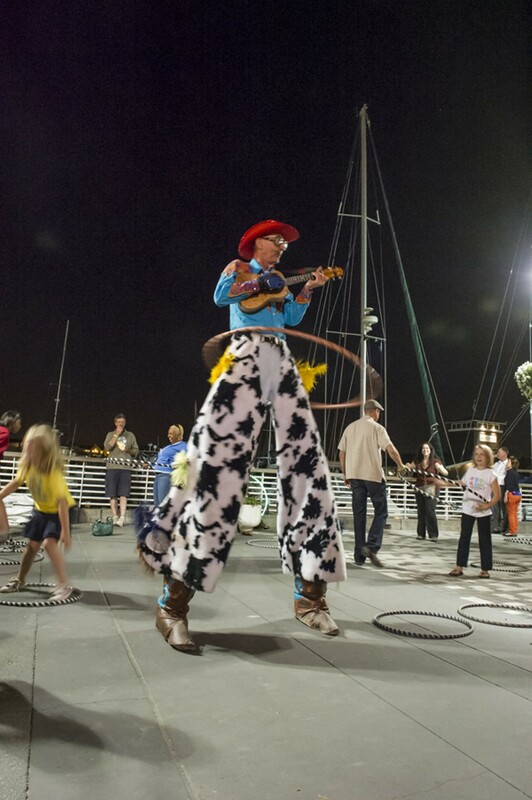 "It's an iconic public gathering space," McLeod said of Jack London Square. "It's gone through its ups and downs, but these fairs are a way of bringing people back down to the square."